The Saturn moons Dione (top) and Rhea form a snowman-like shape in this photo by NASA's Cassini probe, which was taken in July 2010 and released on Dec. 10, 2018. The snowman impression is a trick of perspective; Dione was about 685,000 miles (1.1 million kilometers) from Cassini at the time, whereas Rhea was much farther away, at a distance of about 995,000 miles (1.6 million km). Two Saturn moons really seem to be getting into the holiday spirit. The icy satellites Dione and Rhea do their best impression of a snowman in a newly released photo captured by NASA's late Cassini spacecraft. "Dione has a diameter of 1123 kilometers [698 miles], and Rhea is larger with a diameter of 1528 kilometers [949 miles], but they appear to have a similar size in this image due to the difference in distance," European Space Agency (ESA) officials wrote in a description of the image, which was taken on July 27, 2010, and released today (Dec. 10). 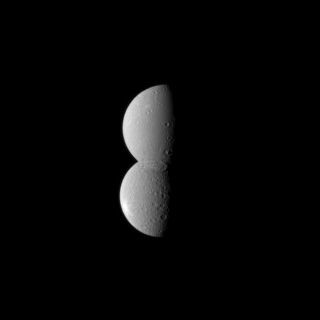 Dione is intriguing in several ways. For example, astronomers think the moon harbors a subsurface ocean of liquid water, as fellow Saturn satellites Titan and Enceladus do. In addition, Dione has many more craters on its trailing hemisphere — the side facing away from its motion through space — than on its leading hemisphere. That's weird, because the leading face should encounter much more debris over time and should therefore get hammered much harder. "This unusual cratering pattern suggests that it suffered an impact which spun the moon around 180 degrees," ESA officials wrote in the description. The $3.9 billion Cassini-Huygens mission was a joint operation of NASA, ESA and the Italian Space Agency. The Cassini orbiter launched in October 1997 and arrived in the Saturn system on June 30, 2004. The mothership carried a lander named Huygens, which landed on Titan in January 2005. Cassini made a number of important discoveries during its 13-plus years at Saturn. The probe found water-ice geysers blasting from Enceladus' south polar region, for example, and spotted huge seas of liquid hydrocarbons on Titan's frigid surface. By mid-2017, Cassini was running very low on fuel. So the spacecraft's handlers steered the orbiter into Saturn's thick atmosphere in September of that year, to ensure that Cassini never contaminated the potentially habitable Enceladus or Titan with microbes from Earth. Cassini's scientific life will far outlast the probe's physical existence. Scientists will continue poring over the spacecraft's many data sets for decades to come, mission team members have said.